Use the ReviewTrackers mobile app to have service techs get reviews in person from customers after their service. Today, word-of-mouth comes in the form of online reviews. Increase your visibility on review sites to get more customers. Encourage customers to leave reviews and get better ratings across all your locations. 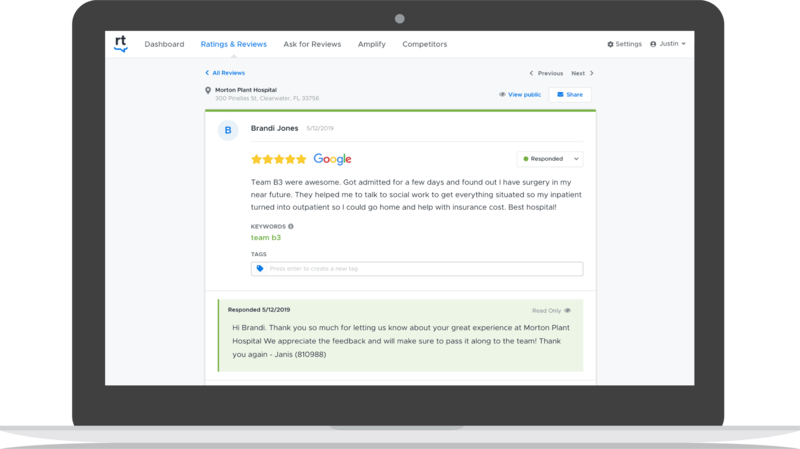 ReviewTrackers helps service companies take control of their online reputation, improve their star rating, and drive more revenue. That starts with monitoring reviews, collecting insights from customers, and making operational changes based on customer feedback. The average service company has a 4.51 star rating. Use our competitive analysis leaderboard to see how your locations compare against any competitors within a 2-mile radius. Get alerts when a new review is posted. Tag co-workers to make sure a review and all customer service issues are addressed. ReviewTrackers brings together online reviews from service-industry review sites like HomeAdvisor, Lawyers.com, and Houzz as well as major review sites like Google and Facebook. 53 percent of customers expect businesses to respond to their reviews in seven days or less. ReviewTrackers gives franchisees the opportunity to respond quickly to local customers’ reviews to meet customer expectations and build loyalty.